While cats are my greatest passion, I love all animals and yearn for a day when our world is a kinder place for them to live. Today is National Farm Animals Day and we're taking a bit of a detour from our usual cat content to discuss the plight of another animal close to my heart. Mudpie approves of my message. My father grew up on a dairy farm which remained in operation until a tragic fire in 2001. As a little girl I loved going out to the barn to visit with the cows, not fully understanding what was destined to become of my newfound friends. One impression I often had of our bovine friends, even at a very young age, was how sad they always looked. It's really no wonder when you stop to consider the tragic lives they lead. 1) Just like every other mammal, cows only produce enough milk to feed their babies. To ensure steady milk production, cows on dairy farms are impregnated once a year through an extremely invasive artificial insemination procedure. 2) Newborn calves are permanently separated from their mothers within 1-3 days after birth (most even sooner, within the first 12 hours). Allowing them to be together any longer than that would only intensify their already deep bond, causing emotional distress for the mother which could affect her milk production. It's not uncommon for a cow to continue to search and call for her baby for days after they've been taken away. 3) Male calves are considered worthless by the dairy industry. The veal industry was created as a by-product of the dairy industry to take advantage of an abundant supply of unwanted male calves. They are usually slaughtered anywhere from a few days to six months old, spending their brief, miserable existence confined in individual crates too narrow for them even to turn around in order to keep the meat tender. Male calves not slaughtered for veal are killed for cheap beef. 4) Due to selective breeding, high-protein feed, mechanized milking and the injection of bovine growth hormones, dairy cows are producing up to 10 times as much milk as they would naturally. This intensive milk production results in widespread lameness from the strain of being constantly pregnant while standing on hard concrete floors, and mastitis, an extremely painful and often fatal infection of the udder. 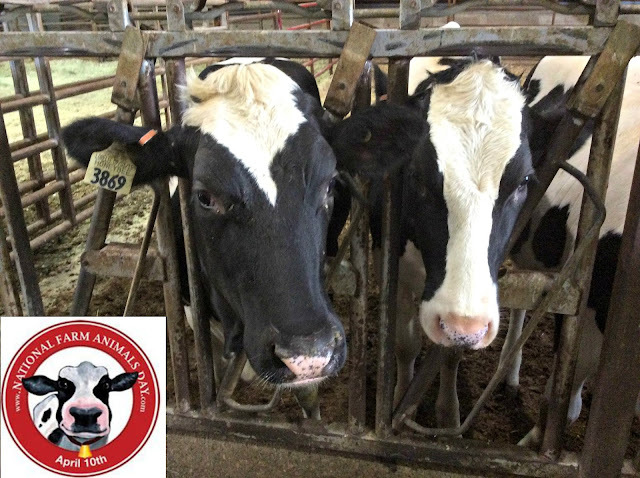 5) A cow's natural life span is up to 25 years, but cows in the dairy industry are usually removed from the herd after 4 or 5 years when their milk production declines. They are considered "spent" and sent to slaughter, processed into supermarket ground beef and fast food hamburgers. Human beings are the only animals that drink milk - the mammary gland secretions - of another species. We have no biological or nutritional need for any breast milk past infancy – much less the breast milk of another species. Cow's milk is the perfect food - for calves, not humans. In fact, the western diet rich in meat, dairy and eggs is associated with a multitude of disease conditions, including obesity, diabetes, cardiovascular disease, hypertension and cancer. A groundbreaking study has even concluded that casein, the main protein in milk and dairy products, is the most significant carcinogen we consume. Armed with this information, and with so many healthier alternatives such as soy, almond, rice, hemp and coconut milk on store shelves today, why do we continue to consume dairy and support an industry rife with abuse? The sad reality of life for dairy cows is hidden from consumers, which is why educating ourselves is so important. Even if you can't remove it completely, if each one of us made an effort to reduce the amount of dairy in our diet we could make a huge difference in the lives of dairy cows. You might even be surprised how easy it is! My human has never liked milk, and has been using non-dairy alternatives (these days, mostly almond milk) for many years. She also doesn't eat beef. A lot of the latter has to do with the cruelty of the beef industry. Someday, she would like to eliminate all industrial-grown poultry also. Great post! I have always thought milk was kind of icky, and it bothers me whenever animals get treated like commodities instead of living beings. I do love cheese and yogurt, though, so I guess I'm still part of the problem even though I don't drink milk or eat beef. Thanks for your informative post, Melissa. I think if most of us witnessed the treatment of animals, in the food industry, it would give us reason to change. This is so sad...and will make us rethink our use of milk and other dairy products, though it's hard to give them up. Thank you so much for sharing these sad yet true facts, Melissa. I was forced to go dairy-free when I suddenly became lactose intolerant last year, something for which I am honestly now thankful. I drink almond milk every day, and have found dairy-free alternatives for cheese, chocolate, yogurt, and even ice cream. Did you know that Ben & Jerry's makes dairy-free/vegan ice cream? They really do! My local stores carry it. They are continually adding more flavors to their dairy-free line. Excellent post. I feel bad for them, but I love all dairy products. Pop loves cows; in fact their kitchen in the old house was decorated in early cow. Neither peep eats beef/red meat although TW does drink milk. She's actually been buying nut milk recently. Pop used to sponsor rescued cows at the Popcorn Park Zoo. I wonder whether anti-dairy feeling will humanize the dairy industry. I grew up among friendly cows; neighbors knew their cows by name, cows would stand at gates and *bawl* for the humans to come out for a share of their milk. My brother and I used to take turns milking first Old Bossy and then Old Jerse, one pair of hands extracting milk while the other pair flicked flies. To the extent that cows bond it seemed to be a bonding experience. Also, when apples weren't ripe, they grazed in an orchard. I know even the cows that produce Ben & Jerry's probably don't live that way any more...but will rejecting dairy products allow more cows to live that way, or cause more cows to be slaughtered and more farmland wasted? I’ve been a non meat eater since a child as I never liked the taste of meat. Milk is completely off my menu as I drink almond milk. But I still eat eggs and fish. People will always consume meat and milk but these cruel practices have to stop. I’ve seen the movie “earthlings” and how horrible the poor piggies are treated on farms. It’s just a shame and makes one sad to be part of the human race. Love this, thank you. There are SO many good dairy-free alternatives nowadays. And per your point about Ben & Jerry's, they have eight (I think) different vegan flavors now and they're all wonderful (yes, I've tried them all). Wow, what a great post! I am a vegetarian, but not vegan. My goal is to one day be vegan (darn you, cheese). The life of animals used/bred for human consumption is so sad. I already drink almond milk and creamer for my coffee. But if I didn't, I'm sure your post would've prompted me to do so! Also, Ben & Jerry's makes a vegan ice cream. I've never tried it, but my brother is vegan and loves it. Of course he hasn't had real ice cream in probably 15 years or more!